CHICAGO – (Realty News Report) – Median home prices are predicted to rise 5 percent next year, mortgage rates are forecast to gradually increase to 4.5 percent from 4 percent today, and new home sales are expected to jump 13.9 percent to 690,000 during the same period, according to the National Association of Realtors annual forecast. 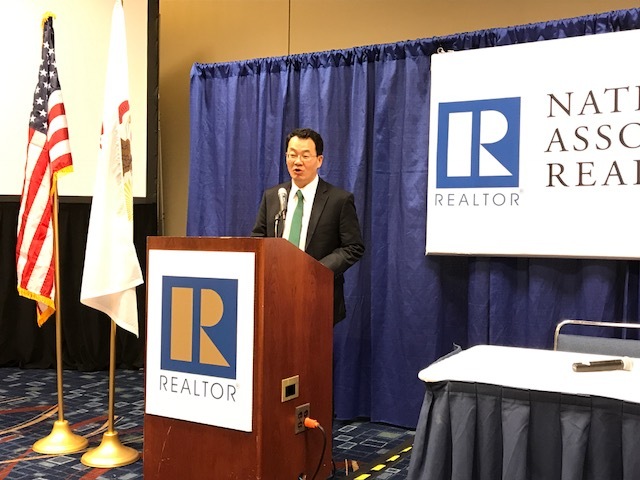 Speaking at the annual Realtors Conference & Expo in Chicago Friday, NAR Chief Economist Lawrence Yun cautioned that the figures were calculated before the House Ways and Means Committee issued its legislative proposal to overhaul the U. S. Tax Code Thursday – which reduces the mortgage interest deduction by half. Currently, a married couple can deduct interest on mortgages of up to $1 million; the GOP plan would cut that by 50 percent. In addition, the Republican draft tax reform plan would cap deductions of state and local property taxes at $10,000. Thanks to the steadily improving U.S economy, sustained job growth, and rising confidence that now is a good time to buy a home should pave the way for an increase in existing-home sales in 2018. However, clouds on the horizon in some areas of the nation as well as possible passage of a tax reform bill that Realtors say disincentive home ownership and threatens to handcuff what should be stronger activity. Already, Yun said, analysts are reporting a softness in the national residential real estate market. Prices are still holding, he added, and there is a critical shortage of inventory in some markets. Mortgage rates are expected to rise next year, Yun predicted, noting that on Thursday, President Donald Trump nominated Jerome H. Powell — a centrist Republican — as the next chair of the Federal Reserve. Powell has been a member of the Board of Governors of the Federal Reserve since 2012 and has supported the Fed’s policy of gradually raising interest rates. After two consecutive quarters of economic growth of 3 percent, Yun expects GDP to come in around 2.2 percent for the year and to expand to 2.7 percent overall in 2018, as long as job growth remains solid and residential construction picks up.